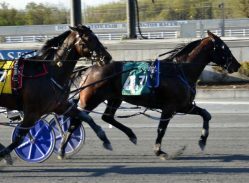 Harrington, DE — Harrington Raceway’s 73rd season of live harness racing kicked off Monday (April 15) with a 12-race program that saw wind gusts up to 40 miles per hour. Slick Tony (#4) and Russell Foster held sway over Daiymir in the opening day feature at Harrington Raceway. Fotowon photo. Not until the seventh race, the featured $15,000 Delaware Special, did a horse outside post three reign victorious. George Leager’s Slick Tony ($23.20, Russell Foster), who started from post position four, was a 1:54 winner over Daiymir and Q’s Cruise. The Leager trainee notched his third win of the year after nabbing the lead late and holding off a late charge from Daiymir. Victor Kirby had a driving triple, while last year’s leading trainer-driver combination of Joe Columbo and Mike Cole teamed up for a double. Live racing at Harrington will continue on a Monday through Wednesday schedule.